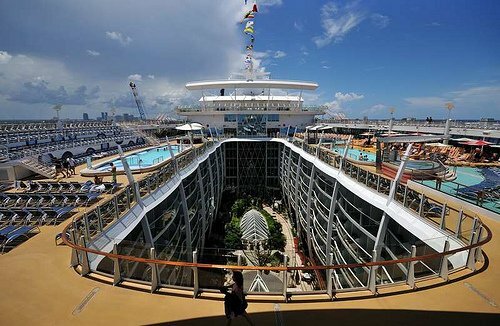 Quantum of the Seas is in the midst of construction currently and already, there’s a lot of anticipation for Royal Caribbean’s newest class of cruise ship. With any new ship, questions surrounding the design and architecture process pop up regarding what obstacles and challenges does Royal Caribbean face and how do they get around them. We had the chance to speak to Royal Caribbean Design Manager for New Builds Jodi Barozinsky, who is working on the design of Quantum of the Seas about how a Royal Caribbean ship is designed. Barozinsky has been designing Royal Caribbean ships for a long time, starting with Vision class ships, followed by Radiance class, Voyager class and Oasis class. Jodi started out working with Royal Caribbean as a design consultant in the 1990s and eventually was hired by Royal Caribbean to work exclusively for them. Since her work on Oasis of the Seas, she has been working in the design department managing the various designers throughout the world that work on Royal Caribbean’s ships. Her early work on Vision class, Radiance class and Voyager class was centered around the casino, the theater, kids area and suites. Starting with Oasis class and continuing to Quantum class, she’s focused more on the overall design of the ship, primarily in the public areas and with the design consultants. Looking at Quantum of the Seas, the biggest challenge Barozinsky identified was the sheer large span of time involved from when a project begins and when it ends and wanting to keep the design contemporary and relevant to what’s hip when the ship launches. As an example, Jodi mentions on Quantum of the Seas they had designed all of the dining rooms and about a year later the Operations team felt the design wasn’t, “current” and had to be re-designed. 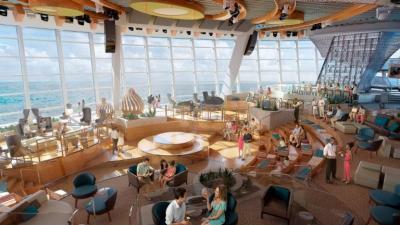 Thus, the dining rooms have been designed twice so far on Quantum of the Seas. Another challenge is living up to Royal Caribbean’s slogans of delivering the “WOW” to their guests and so with every new class of ship, the designers are tasked with coming up with that new “WOW” while staying within the budgetary confines of the project. The other consideration for coming up with these WOW ammenities is the small details, like with Oasis class what to do when a deluge of rain hits the ship and where does the water go considering there’s a huge “hole” in the middle of the ship where Central Park is and prevent flooding. Another challenge for Quantum of the Seas is that the designers are calling the ship, “the technology ship”, which refers to how the team wants to bring in the newest cutting edge technology onto the ship. This includes the way Royal Caribbean operates the ship, the signage, art work and so more much. When asked about what guests should look for in the design of a Royal Caribbean ship, Barozinsky thinks it’s the small, overlooked details of basic design that are major considerations that many guests don’t notice. An example is at any bar, there cannot be anything over the top that may collect dust for health code concerns. Moreover, what they do design needs to hold up so that something does not need to be torn out and redesigned later due to a health issue. Also Barozinsky is rather proud of the lengths Royal Caribbean goes to in terms of guest accessibility. She mentioned Royal Caribbean has its own special guidelines for the cruise line to follow and the result has been a lot of compliments from guests with special needs because they find the ships very accomodating. So what’s the most rewarding aspect of designing a Royal Caribbean cruise ship? Jodi thinks it’s seeing the interest that they get from the highest executive level for what they do and so their work is very imporant and knowing what they work in sails in ports all around the world. If Jodi’s work sounds really fun and interesting and you’re perhaps a student in college looking to be a designer to, her advice to them is take college courses on ship design, which are already being offered these days. Barozinsky also mentioned that Royal Caribbean offers summer internships to interior design or architecture college students and would be a great avenue to take to get the right background to work on a Royal Caribbean team. She also says you have to love it and you give it your all and be willing to work hard. And the reward? The cultural aspect of working with the foreign shipyards as well as the guests you are designing for that come from all over the world.